Where the dungeon ends, another adventure begins! Pathfinder RPG Ultimate Campaign takes you on a guided tour through the parts of the game that happen between monster attacks and quests for ancient artifacts. As some of the most powerful and prestigious heroes around, do your player characters want to build up a kingdom of their own, or lead an army against a neighbouring nation? Perhaps they want to start a business, craft magic items, or embark on a quest that will come to define them. Whether you're looking for help generating a young character or seeking ways to challenge adventurers who've grown bored of fighting monsters one-on-one, this book has everything you need! 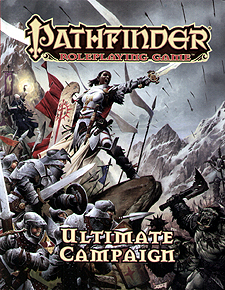 Pathfinder RPG Ultimate Campaign is a must-have companion volume to the Pathfinder RPG Core Rulebook. This imaginative tabletop game builds on more than 10 years of system development and an open playtest featuring more than 50,000 gamers to create a cutting-edge RPG experience that brings the all-time best-selling set of fantasy rules into a new era. Story feats that increase in power as you achieve key goals, making quests and crusades more than just flavour. New rules for retraining and switching classes; honour, reputation, and fame; young characters; investment; magic item creation; and other key adventuring topics. Mass combat rules to help you lead clashing armies and conduct epic battles in a fun and efficient manner - without losing sight of the PCs themselves.